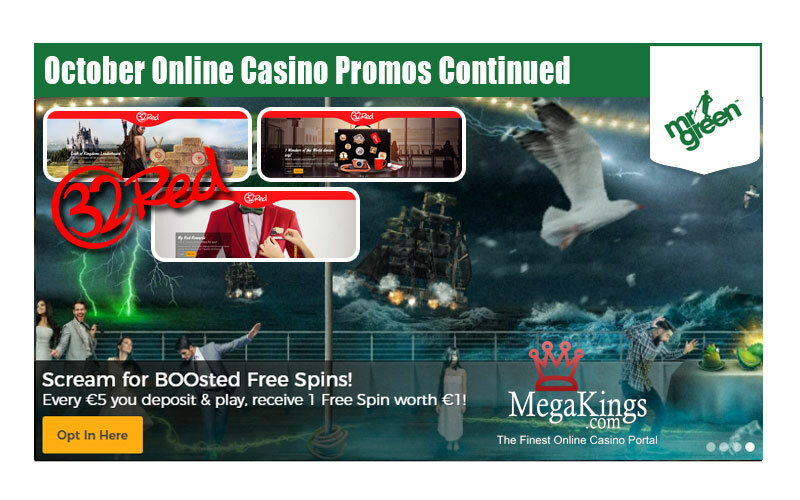 Welcome to the October Online Casino Promos for the mid point of the month. There are plenty of fantastic offers to get your teeth in to. You can win a share of this €3,000 buried booty – fight your way to the top of Davy Jones leaderboard by spinning away on the ‘Undead Collection’. You can transform their accounts under the light of the moon and enjoy a share of €4,000. You need only complete 3 wolfish missions in the fewest spins possible to be in for a chance! Mr Green is blowing in a €3,000 storm for you – the players who have the most WILDS gobbled up by the ‘Tut’s Twister’ bonus feature will top the leaderboard and take home a share of CASH. Every Mr Green player that has completed their first deposit qualifies for 20x €1 Free Spins on ‘Lucky Halloween’ on their 2nd deposit. Players g et 1 Free Spin worth €1 for every €5 they deposit & play. Experience slots in a completely unique and exhilarating way. From 18:00 CET to 23:00 CET every evening, players who enter the Reel thrill tournaments will take home DOUBLE Free Spin rewards – with over 1,000 given away every single day! There’s €2,000 worth of CASH cards available for you this weekend. What do you have to do to claim a share? Nothing but play & enjoy Evolution LIVE Casino – simply keep your eyes peeled for the bonus cards! LIVE Beyond LIVE Roulette and Blackjack players can enjoy Free Spins on the popular ‘Berry Burst’ and ‘Coins of Egypt’, plus Cash boosters Monday through Thursday throughout October. No-one was lucky enough to win last month’s jackpot so it’s an October Evolution Rollover of a whopping €10,000. The first player during the month to complete the Blackjack challenge will win the jackpot. My Red Rewards are made to measure! We’re excited to unveil 32Red’s all-new, state-of-the-art, rewards system! With all the bells and whistles, not to mention the trimmings, My Red Rewards has been specially built to give you the offers you deserve. The 32Red tailors have been busy designing daily offers to fit your unique gaming experience. Below you will find what’s on offer today. Just by opting in and playing this majestic new slot, you can win a share of £5,000 in casino bonuses in the Cash of Kingdoms leaderboard… just opt in and play Cash of Kingdoms and you could win the £1,000 casino bonus first-place prize! If you could visit any of the 7 Wonders, which would you choose? Well, that might not be one of those what-if questions anymore… because 32Red are giving one player the chance to take that dream trip to one of the 7 Wonders below! Simply opt in, play any of your favourite games from Monday 8th October until Tuesday 23rd October and you and your guest could be jetting off for an unforgettable experience.